President Bashar al-Assad is already at work in the early morning in his private study on the slopes of Mount Qassiun. He has a full agenda. The re-admission of Damascus to the good geopolitical society is still recent, after the arrival on March 7 of the envoys sent by Obama to resume the dialogue interrupted by four years of American sanctions. And Assad, solemn in stature, elegant in his blue flannel suit, is busy, so it seems, in renewing the threads of international diplomacy. The isolation of Syria is virtually over. Old concepts and labels – Axis of Evil, rogue States – have all of a sudden evaporated. So it is natural to ask him: what is required, Mister President, to relaunch an understanding between America and Syria? What should be done to bring it back as it was in the beginning of the Nineties, when Hafez al-Assad and Bush father had succeeded in creating a mutual trust, with the promise kept in 1991 of the Madrid Peace Conference? “There is a rule, first of all: States act according to their own national interests. As to how far the American and Syrian interests coincide, well I can say it is 80 per cent, leaving out a margin of 20 per cent for the rest, to be on the safe side”. Would you give us some examples? So how can one guarantee that success? But America and Europe are expecting from you an important step towards Iran. Are you willing to take it? In your opinion, will Tehran accept? Such as Hezbollah and Hamas? Will you cooperate also regarding them? Do you see a renewal in the negotiations with Israel? When? Before the Gaza War? Would you tell us about it? Is the Arab Peace Plan of 2002 still on the table? Yet Obama is talking about a new Middle East Order. Will the American mediation make a difference? What Countries do you have in mind? Who is leading the diplomatic effort, Washington or Paris? Mister President, you say you are available in the efforts for peace, in mediating for a dialogue with Iran, but what is the price requested by Syria? And now, how to repair that? What do you expect from president Obama’s announced speech to the Muslim world? In this season of openings in the international diplomatic field, how will Syria reposition itself in the arena of democracies? Will it follow through on its promises of civil liberties made at the Congress of 2005? Summing everything up, Mister President, might there appear a brighter horizon? That sounds like Obama’s “we can”? Would you like to meet President Obama? 2. Uncle Sam is in deep trouble with the next bubble that may burst sooner rather than later being the US Treasury bills that people are buying because the dollar is the de facto commerce currency and reserve currency of the world. This is the only instance where a money printing machine can make money without any economic or precious metal backbone behind it. The Chinese as stuck as the value of what they lent to the US will dwindle if the dollar goes down and it will go down. So I would predict that they will quietly start to buy Gold and other precious commodoties. When this bubble bursts the dollar will lose its value and will be dethroned as a reserve currency and a new global financial order will emerge after huge disruptions. Just watch Eastern Europe go bankrupt. 3. The G7 is now the G 20 and the money will come from Asia therefore the new IMF and the World Bank will have to have different rules to accomodate the desires and interests of the donors. I would predict an accomodation of Chinese interests fully in the next few years. 4. In the ME, the only salvation is an EU like integration of the divided countries to accomodate the incredible demand of the population explosion and it necessitates solving the Israeli Palestinian problem. KSA is trying to do the later to defuse the salafist appeal and to find a new modus videndi with rising Shia Islam. c) Israeli extreme politics will lead to the suicide of the Zionist project as the two state solution is no longer possible in my opinion. More important the idea of Israel enslaving the population of the ME has come to an end in the ruins of the US disaster that is called Iraq. b) the allies of the KSA have proven to be unreliable with dismal intelligence and poor planning this is due mainly to the disease that afflicts the majority of the Sunnis: extreme individuaism combined with zero sence of civic duty. THis means that any money or effort to organize any alternative to the Shia or Salafist groups will be met by theft, nepotism, corruption, and complete disorganisation. The best example of this is the Palestinian Authority. 8. The war on Gaza was a double failure for it did not achieve any aims but more importantly and for the first time has shown that the war was illegitimate whereas in the past the so called “right of self defense” had allowed Israel to be tolerated by the West with regard to its aggression. Now we see not only a genocide like policy and a war on an entire population but even the ability to take refure has been abrogated. This the first step in the strategic defeat as numerous individuals and organizations and even countries like Spain are talking about war crimes an crimes against humanity and Israel deploying its legal experts to protect army commanders from prosecution should they leave Israel. The paradox is the the more Israel uses force the less legitimate it becomes: this is a new barrier that has been breached by the resistance to Israeli Zionist extremism. Remember that France and the US won almost every battle in Algeria and Vietnam respectively and lost the war because they lost the legitimacy of it the first shot they fired and more weapons and force only make things worse. I believe that the current leadership of Egypt and KSA are obsolete and we should not expect any change any time soon. Do You think bashar wants a weak army while you look for a mighty one? Assembling an army that can fight a battle with israel needs tremendous financial resources that a country like syria simply does not have. Bravado from a keyboard is not sufficient. Oh okay….Will leave you two together then…. I am sure that the President will be thrilled to know that he is $50 million away from parity. Come to think of it, I keep wondering what has made him wait this long to pick up the phone. Could you please stop interrupting, we are waiting for the president’s reply. Now, Joshua, Alex, Ehsani, QN, Shai – anybody (except perhaps the Syrian Nationalist Party): what would you say is the best history of syria from the mandate to the rise of the Baath (or later)? The highlight of Syrian History and Syrian Nationalisem is that it has managed to creat a STATE and not a Political Farm like Lebanon, and not a helpless foriegn-funded Protectorate like Jordan, and not a great 80 million plus nation like Egypt that can not open its mouth for fear of upsetting the US aid donners. And it forced others to respect its point perhaps rather than becaming a puppet state or blood wasteland like its more “rescourful” and “enlightened” other neighbours. In other words, it has kept the home fires burning in the face of ugly winds and has marvelously survived. At a cost yes, but with pride, purpose and dignity. 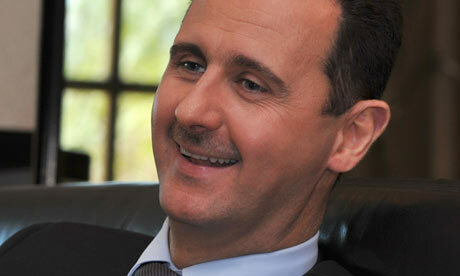 Thank you for posting such an informative interview with President Bashar al-Assad. Once again, we stand in awe of the President’s grasp of ambiguity. Syria’s unflinching foundation in foreign policy. Hot moist air at best. It seems that Bashar has “unclenched his fist”. Will Obama keep his promise and “extend his hand”? Saudi is very much integrated in the US sphere of influence. Saudi’s policies towards Syria will obediently follow the US administration’s route regardless of any other factors. As the US is now following a more “neutral” policy towards Syria, Saudi is obediently (but probably grudgingly) following a similar policy with Syria. Historically this has been proven true during the last 60 years (with few exceptions). The Saudi regime and media only wave the Arabism flag as a legitimacy-seeking approach when the US direct involvement in the region deteriorates. When the US is directly involved on the ground in the Arab World (through wars and occupations) the Saudi regime (and its media empire) has repeatedly damned Arabism venomously. ANKARA (AFP) — US President Barack Obama will visit Turkey on April 6-7, following an invitation from Prime Minister Recep Tayyip Erdogan to attend a forum aimed at fostering dialogue between the West and the Muslim world. Erdogan said late Wednesday he had invited Obama to attend a meeting of the Alliance of Civilizations initiative in Istanbul on April 7 and expressed surprise that the US president responded with a proposal also for an official visit to Ankara the day before. “I didn’t expect (an official visit) that soon,” Erdogan said in an interview with TGRT television, adding that Obama was expected to attend the Istanbul forum as well. “The official visit will be probably combined with the Alliance of Civilizations meeting… That is very meaningful for us,” he said. Predominantly Muslim, secular Turkey is a NATO member and a close ally of the United States in a troubled region. The UN-backed Alliance of Civilizations initiative was launched in 2005 in a bid to help overcome prejudices and misunderstandings between different cultures and religions. It is co-chaired by Turkey and Spain. Obama has voiced determination to improve ties with the Islamic world and said he would give a major speech from a Muslim country during his first year in office. US national security advisor Jim Jones has informed Ankara that Turkey is among several venues the White House is considering for the speech, Anatolia news agency quoted Turkish Foreign Minister Ali Babacan as saying Thursday. Obama’s programme in Turkey has not yet been finalised and it is not known whether he would make any speech during his visit, Babacan added. Erdogan said the agenda of bilateral talks with Obama would include the Middle East conflict, efforts to end the division of Cyprus and Turkey’s bid to join the European Union. US Secretary of State Hillary Clinton visited Turkey earlier this month, saying that it was time to buttress relations between the two NATO allies, which went through a chilly period over the US invasion of Iraq. Turkey’s state-run TV will launch a channel to air in the Arabic-language in the near future, Prime Minister Tayyip Erdogan said late on Wednesday. Preparations for a TV channel in Arabic are about to be completed, and the TV channel, under the auspices of the state-run Turkish Radio and Television Corporation (TRT), could start broadcasting at any time, Erdogan told broadcaster TGRT Haber. He also told the news channel that TRT would launch a radio station broadcasting in Kurdish. Turkey recently took steps to boost the cultural and democratic rights of Kurds with the Jan. 1 launch of TRT-6, a TV channel that airs in Kurdish 24 hours a day. It seems that Bashar has “unclenched his fist”. That’s your perception. Not mine. I see you’re easy to impress. President Assad seems to make good points, i hope Obama is listening. In my opinion , two things that the Baath party did and had a great impact on me are . Free Education to medical school and other university subjects for all , no matter what their ability to pay. Teaching religion at school and taking that from the Churches and mosques. So religion is taught as it is supposed to , a way to live with others. There is another good thing they did which is support and encourage women rights on many fronts; still they need to do more regarding that. What they didn’t do and failed miserably doing until now, is to support democracy as a Syrian political lifestyle and to implement the state of law instead of the state of emergency. They didn’t look after quality control regarding anything, especially industry and agriculture which is a major issue since it affects everything around us from exporting to environmental quality when you let ignorant people to manage those sectors. Some individual are trying to do a better job lately but there must be a national awareness, support and encouragement to do more. To top all the above they didn’t/don’t encourage Syrians to be creative in whatever they do, there are too many bureaucracy, obstacles and social taboos that must be lifted to let people give their best. “Syria is a dictatorship, and dictatorships typically need external enemies to furnish a gloss of domestic legitimacy to their rule. As a result, modern Syria has been a scourge of all of its neighbors, not just Israel but also Turkey, with which it nearly went to war in 1998; Jordan, which it invaded in 1970; Iraq, against which it supplied troops in the 1991 Gulf war; and Lebanon, which it has sought to dominate, either directly or indirectly, for many decades. Assad’s sense of himself as the anti-Sadat, the natural leader of the “rejectionist” front that would never come to terms with the legitimacy of Israel’s existence, cannot be understood without reference to the peculiarities of Syria’s domestic politics. His secular, Arabist Baath Party was naturally in competition with, and threatened by, Syria’s powerful Muslim Brotherhood. Even if Assad had been so inclined, he could hardly allow himself to make concessions to Israel that the Brotherhood could credibly trumpet as a sellout of both Islamic and Syrian interests. That consideration was powerfully reinforced by Assad’s religious identity as an Alawite, a group that makes up about 12 percent of Syria’s population, is theologically closer to Shiism than to the country’s predominant Sunnism, and is often considered heretical by orthodox Sunni clerics. Peace with Israel, in this calculus, risked the security not only of Assad’s regime, but also, conceivably, of his own sect. This is not a recipe for peace-making. I really don’t understand what happened to the American and Israeli policy makers who, through their contradictory approaches, have allowed the Syrian government to extend its head above the ground like a poisonous serpent. I suggest that these policy-makers seek to educate themselves in bazaar market dynamics and rug merchant psychology before embarking on a process of engaging the Syrians and/or the Iranians. You are basically dealing with bazaar merchants who are trying to negotiate some kind of political arrangement for a region in a way that suits their bazaars. In addition, the thought of distancing Syria from Iran is not achievable for the simple reason: This relationship is based on sectarian ideological grounds and not just some kind of accidental coincidence of interests between the two countries. In fact, the basis for this relationship was established by the senior dead Assad and the junior Assad is simply carrying over the will of his father. The modus operandi for the Syro/Iranian axis is simply a survival of a minority Alawite rule in Damascus that has more in common with another sectarian regime – the Shiite regime of Iran which is seeking to re-invent history, particularly the Islamic history in a way that suits its agenda. The biggest threat to the alawite rule of Syria – according to the alawite rulers – is the sea of Sunnis around them and not the Jewish State. Therefore an alliance with Shiite Iran makes a lot of sense, and when you take into consideration this Alawite fear, you would begin to understand the unexplained frustrations of all those naïve American and Israeli peace seekers with the Assad senior and the forthcoming disappointments with the current junior. The well known truth among ordinary Syrians and most Arabs is that the alawite rulers of Damascus have no real interest whatsoever in obtaining the Golan back because the resolution of the conflict with the Jewish State will lead to the demise of their rule. Bret Stephens has touched on this subject in his article when he alluded to the Muslim Brotherhood, but he did not elaborate on the issue. Assad’s priorities are the survival of the Alawite rule even if it will cost him the loss of the greater part of Syria and simply keeps in power in an enclave in the coastal region of the so-called Alawite Mountains of Syria. It is based on this realization that I made the suggestion in a previous thread that it is in Syria’s people best interests to be ruled by a country like Israel similar to the way Israel rules its Arab citizens rather than being occupied by such minority Alawite rule. Perhaps a direct rule by Israel is an overstatement. However, considering the predicament of the people of Syria it is still in their best interests. I would suggest that any Israel or American administration to establish a coherent policy that would require a public recognition of the State of Israel a pre-condition for any engagement with any regime that happens to be ruling in Damascus. Engagement here should mean any form of diplomatic, commercial, economic, cultural or other exchanges by the US and its allies with the Damascus regime. The policy be strictly enforced regardless of which party or parties happen to be the Governments in the US or Israel. You realize that you’re dealing with a dictatorial regime that uses time to its advantage with the hope that a new administration will emerge every few years in democratic states like the US, Israel or Europe. This is how dictators survive by knowing how to exploit this gap in Democratic regimes. I also suggest that Israel and the US spend great deal of money and effort to reach to the Syrian people directly and prove to them the benefits to their own well being of befriending the Americans and the Israelis. The case you made in your brief of your recent visit would a good approach to this end. In addition, there should be a strict ban on back room deals with such regimes. Most mistakes that were made in Syria , they were made for lack of expertise not lack of good intentions , About Democracy , I agree with you and from what president Assad said , He seems to be moving to a very good Idea , i felt will help a lot , that is having a senate composed of elected officials , and i say they should be 2 senators from each county (( Muhafaza )). Recently Dardary the economic man of Syria said something made me think that he is in the US , He said that most jobs are created by small bussiness , That indicate that Syria will have more opportunities for small entrepreneurs. one more thing , few years ago during the problem between Syria and Lebanon , there was shortage of people with MBA in Syria and that is confirm the lack of expertise in Syria not lack of good intention , lack of expertise can be fixed , not caring people is harder to fix. So Syria is on the right track , you are young , just have some patients , you will get there , better late than never . I would suggest that any Israel or American administration to establish a coherent policy that would require a public recognition of the State of Israel a pre-condition for any engagement with any regime that happens to be ruling in Damascus. Your suggestion is a bit too logical for the liberal Israeli crowd. I didn’t detect enough self-doubt, hand-wringing and whining about racism. PS – Glad you liked the article. It’s always good, once in a while, to be reminded of your sanity. AP, knowing that I’m dealing with bazaar merchants, I’d say that’s a bit over my capacity. AP, Did the mental hospital you visited couple weeks ago test too many drugs on you? Your IQ is lower since you came back from “the spaceship” I suggest you stand on a chair when you want to write the next comment, it might help raise your IQ and make you taller. Majed, don’t get insulted, but you are spreading lots of ignorance and nonsense, why don’t you get AP’s mental hospital address for treatment..It might help to get you out of your tent, lose some weight and have some fresh air so it’s all win win. No need to thank me both of you guys. It was my pleasure! Obviously Jad is suffering from the alawite survival syndrome. So he has to do anything to avoid the spread of “ignorance and nonsense” of exposing his deep fears. By the way, you can always go back and hide in the mountains above Latakia as your farming ancestors used to do. But the spreading of “ignorance and nonsense” will continue nevertheless. You’re just too obvious to cause any one an insult. So don’t flatter you ego that you have actually achieved anything. You are such a smartass I bet you could sit on a carton of ice cream and tell what flavour it is. Alawite survival syndrome! your stupidity, is obviously incurable. you are making fun of me and my ancestor being farmers? that is the funniest jock I ever heard..hahaha…how dump. you also advise me to go back in the mountain to hide, from who? your KSA religious police? Or from you? Fat guys like you can’t even walk, how are you going to climb any mountain? hahah…that is pure insanity, Ya 7aram shou mas6oul. I don’t think it’s worth it to engage in any argument with Majid. He obviously carries with him deep-seeded hatred and severe sectarianism, such that discussions with him are futile. And just remember this saying: “Never wrestle with a pig because you’ll both get dirty and the pig likes it.” Cheers. And just remember this saying: “Never wrestle with a pig because you’ll both get dirty and the pig likes it.” Cheers. You’ll have to forgive Majid, his articles haven’t been appearing in the Syrian news media for a long time now. Obviously Jad is suffering from the alawite survival syndrome. President-for-Life. Idi Amin and Saddam Hussein would be proud. You are absolutely right, I liked the saying, very true. Honestly though, where all those sectarian people come from? there must be a farm or something where someone give them an intensive course in hate and segregation “how to hate in three days”. I just feel sorry for them when they let the sectarian hatred to take over their minds and souls. Ya 7aram. You both gave me a very good laugh. Especially, JAD who continues to think I’m Saudi. Go on JAD believe what you like. Ignorance is a bliss sometimes. NOUR, I wouldn’t care about the opinion of an SSNP who continues to dream of Cyprus as part of so-called greater Syria. You too go on and dream. Sometimes a dream is better than an ugly reality – that is the present condition of your Syrian backyard under ex-farmer president for life. You’re absolutely right. So if I’m not a fat Saudi living in a tent you have to do something about your hideouts in the mountains. Fat Saudis may not be able to climb mountains (at least according to your stupidity) but you never know what others can do. Hope that helps you to cure your incurable lack of brain. I’m so scared from you Majed, did you get my address here and in the mountain of Latakia yet? I’d better tell my people to be careful that you have some plan for them. By identifying with their aggressors, assuming their attributes, and imitating their aggression, crime victims cognitively transform them-selves from the people threatened into those making the threat. This mental transformation allows the victim to achieve some feeling of strength in an otherwise humiliating situation. In short, when an aggressor sticks a gun in a person’s face or kidnaps someone at knifepoint, often the victim’s only chance for survival is to join the aggressor emotionally, as well as physically. Anything short of total cooperation likely will result in death. In addition to its cognitive utility, identification with the aggressor serves an important, external function. With this defense mechanism, victims make an intuitive prediction regarding their aggressors’ reactions to the bond. Instinctively, victims know that if they appease their aggressors, their chances of survival increase. Aggressors assured that they are “right” or whose controlling ideations are bolstered by the companionship of submissive victims will less likely dispose of this “positive” reinforcement. In this way, the victim’s identification has somewhat of a controlling effect on the aggressor. Intuitively, the victim has outsmarted the aggressor. From a causal perspective, some theorize that identification with the aggressor results from the victim’s appreciation for being allowed to live. When abductors threaten to kill victims, they establish intense fear in their captives. However, when abductors change their minds and begin to show compassion, their victims feel gratitude toward them. While I agree with you regarding the fact that we do very well here in preparing our children to accept defeat gracefully, most of the types of elections you have described in schools also serve to over emphasize the meritocractic system we have here. Be it scientific, athletic, or artistic abilities. The problem is, when you combine this with the winners take all mentality, and with the entrenched suspition of authority and insecurity about knwoledge, we convert the democratic induction into a divisive process. Joks and bueatiful girls have all the fun, while hard working kids are called nerds and austercised. Something has to be done about that, so many talents are lost during junior high due to this type of peer pressure, especially those whose parents are working two jobs each and can hardly follow up on their kids. I still believe that our K-12 educational system here in the us is in need of major reform, but I do not know where to start. I posted this few minutes ago, but it got lost in moderation, let us hope it does not this time over. Majid is not stupid, He suffers a well known syndrom called identifying with the aggressor. This is a response to trauama caused by the victim’s own feeling of inability to do anything to stop aggression. There is no doubt that many of us feel victimized by the inability of Arab states over 60 years to put up any meaningful and effective stop to Israel’s continuing aggression against our lands and our poeple. Given the dominance of Israel’s Army against organized armies or our own states, the feeling of humiliation is serious and can not be discounted, out of that humiliation rise many possible responses including identifying with the aggressor. This response belong to a class of psychological responses to traumas known as “ego defenses” . Below is a little description i cut from a website, among many others, describing this particular psychological response to traume. The dynamics of the reinforcements between Majid and AP are stunningly conformative to the symptoms desribed below. Identifying with the aggressor is credited for substantial portion of gang memberships. It can even be observed in the work place. In common slang it is a variation of if you cant beat them, join them. The process of identification occurs when one person forms an emotional bond with another. Introjection then takes place, whereby identifying parties modify their own personalities and physical characteristics in an attempt to imitate the person they are identifying with. Typically motivated by unconscious forces, identifying parties may not recognize the effects that identification has on their actions. In addition to its cognitive utility, identification with the aggressor serves an important, external function. With this defense mechanism, victims make an intuitive prediction regarding their aggressors’ reactions to the bond. Instinctively, victims know that if they appease their aggressors, their chances of survival increase. Aggressors assured that they are “right” or whose controlling ideations are bolstered by the companionship of submissive victims will less likely dispose of this “positive” reinforcement. In this way, the victim’s identification has somewhat of a controlling effect on the aggressor. Intuitively, the victim has outsmarted the aggressor. It seems OTW has formulated a theory. Of course it remains to be tested in practice. Otherwise, it is only buzzing in an empty box hanging above your shoulder which you call a head. Nice try Off The Wall – but in reality it is Off Your Head. Seems that I hit the spot!, anything substantial to say other than nonsensical phrases? The theory is not only tested in practice, it has been used in court to reduce sentences, and to a lesser extent to exonerate. Sometimes it succeeds when the trauma is severe and identifying with aggressor reaches a level that is legally comparable to insanity plea (i.e., dentifying parties may not recognize the effects that identification has on their actions). Sometimes it fails, when the Jury decides that one continues to be responsible for ones action. In the latter case, the presence of other victims who did not opt for the same psychological survival mechanism play a major role in persuading the jury that the identifier had other options, but chose to not to pursue any of them. It exists. And it is not my theory. I have been following the conversation on SC, and the dynamics through which you and others (Chris, AP, for example) reinforce each others points illustrates my point very strongly. I am making no judgment about your character and the only thing I am attributing to you is a sense of survival. Anything wrong with that? Really?? What spot it hit besides your empty head? Come on guy, you’re over flattering yourself!!! You do give me some credit by admitting that you’ve been watching my conversation. But honestly, I never read any of your comments until you addressed me directly. You also give me credit by using my own argument about the sense of survival which I already attributed to your alawite comrades. If you found my last comment phraselike non-sensical and brief it is because I found yours not worthy of consideration – another reason I usually don’t read you comments. I hope it now makes sense to you. There is no doubt that many of us feel victimized by the inability of Arab states over 60 years to put up any meaningful and effective stop to Israel’s continuing aggression against our lands and our poeple. Given the dominance of Israel’s Army against organized armies or our own states, the feeling of humiliation is serious and can not be discounted, out of that humiliation rise many possible responses including identifying with the aggressor. When do you suppose this feeling of “victimization” and “humiliation” will dissipate? Maybe those who feel this way can come to terms with it somehow. Dear OTW It’s always a treat read your comments and I thank you for elevating SC comments level to higher standards, as I said before it makes me proud to see and read for people like you. There is one point I’m worry about which is when people abuse their ‘syndrome’ and take advantage of the free system and society they live in to justify every racist, sectarian and hate ideas they spread, knowing very well that they can always use their sickness or even their ‘mental illness’ as reason for their behaviours and words. Every ‘Human’ knows right from wrong even if he doesn’t believe in God, he/she knows that judging others according to their believes, their skin color, their race, anything that is different from him/her is a wrong thing to do and even to think about. What’s wrong of being a proud Alawite, what is wrong of being a farmer, a fisherman or even mopping the floor? I don’t see any kind of insult in all the mentioned point and I’m not sure why anybody should. Religion taught us to judge stealing, killing even adultery but it didn’t tell us to judge and prosecute believes and faith, God didn’t, only Radicals and Racist people does that. Killing someone because of a lunatic radical told me so is not justify nor can letting that lunatic talk should be considered as freedom of speech. A racist should be treated as a racist, so is a sectarian, both need to be put away from society and not let them allowed to get out of their cages, the world is a much better place to live in when we quarantine those people or at least treat them till they become a better member of the society. “Never wrestle with a pig because you’ll both get dirty and the pig likes it.” and we have couple of them on here enjoying the their bath. AP, I hope you didn’t fall into the trap of believing that such feeling of humiliation and victimization is actually common in the Arab world. I can tell you from fact that this is an imaginary hypothesis in general and the Arabs have no such shortcoming whatsoever. Some, and I emphasize some in the sense of low percentage, like the Palestinians may have this feeling. Perhaps also some Syrians fall into this category because they feel helpless due to their alienation from a band which occupies their government despite their will. On the whole, the Arabs feel very good about themselves and they are easy to make friends with. I mention here the Jordanians, the Egyptians, the Lebanese, the North Africans as few examples of people with normal lives and social skills. Syrians on the hand are plagued by a succession of regimes that rely on empty slogans and futile ideologies to keep the people in a state of discontent and I would say abject poverty for the only reason of holding on to power (you know the Idi Amin, Saddam, President for life mantra). The Syrians, on the whole, are in fact a good natured people but they need a different government in order to help dissipate this invented imaginary sense of humiliation and victimization. Now, I’m forced to go back a little bit to the comment of OTW in which he invented his ‘brilliant’ theory about identifying with the aggressor as a result of being humiliated and victimized by that same aggressor. The mere invention of such theory to explain OTW’s perceived association between people like yourself, myself, Chris and perhaps others tells you a lot about the state of the Syrian mind as it is brainwashed by the government which uses these techniques to maintain power. In this case the subject of this government (OTW) is using the same techniques of his government to formulate his critiques of others. It also shows you how much the state of narrow-mindedness of a people (Syrians) has reached whereas the same people were known to be creative and resourceful before being occupied by the current rulers. I don’t understand why a person wouldn’t come up with a different interpretation than this stupidity to explain his perception of an alleged association. For example, one possible explanation (assuming this association really exists) would be something like some people with like minded opinions are teaming up against an orchestra (SC orchestra) which is trying to create a blog on the same line as one party state/one party rule/one party media. Or simply, an explanation like people with similar views engage in a dialog in order to present a point of view which is completely lacking (and even sought to be muted) on this mouthpiece of a dictatorship!!! Very good questions and sa7h el-nom! There is nothing wrong in being proud Alawite,but one must also understand the motives of others in order to appropriately confront hate. As for what Majid’s thought that he was insulting you by calling you an Alawite farmer, well, I am proud of my ancestors closeness to the land, they are the salt of the earth, just tell him that you appreciate the complement. Remember that he also called all Syrian’s bazaar merchants. He is being childish and antagonistic not out of his mental condition, but out of lack of capacity to think of any substantive thing to say. When he called my an empty head, I answered with nothing more than self deprecation. Him calling me an empty head does not add or take anything from who I am, it only adds to his own confusion in a rather comical way. Just give him an unpredictable response. It will throw him off and make him even more confused than he already is. I admire your courage and you dedication to a Syria for all of its citizens, a prosperous industrious Syria, in which people like yourself can and will contribute the incredible talents they have. May be it is a little late for me, but never too late. Keep your eyes on the prize, it is an incredibly fascinating prize and no Majid should make you lose that focus. Syria may have some who would attempt to drag us into internal sectarian conflicts. I have trust and confidence that this will not be the case, but no one can guarantee that some sick people will not act sick or criminal. Let us hope and work so that they will not succeed. So far, all signs indicate that they will not succeed. And that gives me a reason for guarded optimism. As for fighting, I do not fight, I simply state my opinion in manners similar to our wise Norman when he says, and that is my take on things, or something to that effect. You ask a question that demands more time than my short break allows for. I will try to respond hopefully soon, but I am making no promises. You also have asked a very serious question, whose answer is rather complex. And the answer depends on where you stood (mostly economically, and to a lesser extent, educational wise, during each of the time periods). I will try to give my worthless answer, but I can not guarantee that I will have time soon to do so. I have never seen your photo to judge whether you are fat or not. Furthermore, with my recent wait gain, I would be very reluctant calling anyone fat. Finally, when did I ever use the term fat Saudi? Your attempt to destroy what you call my theory has so many words, but very little substance. Your hate of Syrians is rather evident, but i think it hides fear of some lost prestige. It makes anything you say suspect. Are you seriously saying that of all Arabs, Syrians have no social skills. Your verbal tantrums are strong indications of your superb social skills, which consists of nothing more than deep intellectual surrender to a power you fail to understand. At least AP has some reasonable motivations to defend the sometimes defensible other times indefensible. You continue to attribute a single dogmatic view to every SC commentator who dare to expose the shallowness of your assertions and you seem to fail, times and again to recognize the diversity of opinions around here. When did I say that? Did you not understand that the bazaar merchant phrase refers to the Syrian and Iranian rulers? AP, I hope you didn’t fall into the trap of believing that such feeling of humiliation and victimization is actually common in the Arab world. I guess I must have. I’m a bit naive in these matters. The Main Stream Media, Hanan Ashwari and Ed Said have basically told me all these years that it is my people’s fault for making the Arabs feel this way. I’d like to learn more about your interest in the forum. Leish za3lan? If you are not Saudi and you are not fat and you are neither stupid nor mentally sick and you don’t write nonsense or ignorant comments why to get that offended? Unless you are all the above you wouldn’t even write back, but here you are barking on everybody….so AGAIN Sit and Stop barking you are going no where without a leash. Are you saying that when you go back to the mountains you still need to be leashed while doing your farming? You see a farmer is a farmer no matter how long he lives in a city and even if you make him a president. He still longs for his good old day attachement to the leash. I also bet you have a natural talent for barking. Otherwise, who would use such language except a born-barker. OTW, I also find your arguments very shallow. So you find me shallow and I find you even shallower. At least we agree on that. I wasn’t attempting to destroy your so-called theory. I was just trying to advise AP on a trap you were trying to set up. what you said about farmers is hateful and speaks volumes of the level of self delusion of grandeur you have. Even a most vile Egyptian pasha would have thought twice before uttering such contemptuous and contemptible words. It seems to me that you hail from a long tradition of submission to occupiers and abuse of your own countrymen. And with such contempt for the majority of people in the middle east, which are our rural population, you still have the audacity to lecture us about democracy and authoritarianism. I guess AP should be a little concerned now to associate with someone who is willing to display such contempt for farmers and peasants. For he is smart enough and well educated enough about the history of his people to recognize that the early builders of his beloved Israel were as much peasants as they were city dwellers. They were the ones who guarded much of the romantic allure of Zionism. It seems that your problem OTW is your fear of some kind of association between AP and me and not your so-called respect for farmers. I think AP is still smart enough to realize that I’m just reminding an ignorant alawite (JAD) of his ancestry in order to shut up a smartass who thinks that by spending couple years in a city he can call himself civilized. If you don’t have any other subject to discuss why don’t you find someone else to play with. I’m horned to be called an Alawite and to be a Farmer, most Alawite doesn’t have the small sectarian brain you have (I doubt you even have a brain though)We all are Syrians and we all are very proud of our religions, our backgrounds, our farming ancestors and our lands, which is obviously above your understanding. Your barking won’t change anything or even bother me or any other Syrian or Alawite in anyway, the opposite, you are showing who you truly are; Pathetic. It’s fun to watch your solo freak show on SC. Keep writing until you let all your hatred out so you might feel human again…one day you will, keep dreaming Pinocchio…Good Boy! Go ahead, you can even associate with Netanyahu or Liberman if you want what do I care. But when you act as a provocateur inciting hatred between us Syrians, and when you start throwing slur it becomes my obligation to expose you and remind you, not of your ancestry, for it is very irrelevant, but of what you have become. You are in no way like minded with AP. He has never spoken the way you do, even in the most heated discussions. He is smarter than I, for sure, for he is not interfering in your defense. Not on this issue. He knows that people like you, would throw a racial slur at a Jewish person with the same ease they throw a racial slur at an Alawite, a Shia, or at anyone who is not like themselves. Your association with him does not scare me. Heck, I associate with him, I agree with him on some issues and disagree with him on many others. Like every one, I have my insecurities, but I promise you, an online blog association between someone I never met and another person I never met doesn’t even register on my insecurimeter (linguists on board, can I claim this absurd word?). Killing his own people, just because they ask for basic human rights.